Employees are the backbone of every organization. The performance of every organization depends on the performance of the employees. The number of good employees an organization has, the more is chances of its success. However, it remains a secret of success that those organizations who recognize their employees normally rule the market. Try the employee recognition software which are designed to keep a track record of all the employees of the organization and also keeps a record of their functioning while they are in office. Use of this software has been adopted by the leading organizations to get better results for their production. Employee recognition does not only help to provide you skillful labour but it also cast positive impact on the work environment. Are you the one who provide employee monitoring service? Hey!! 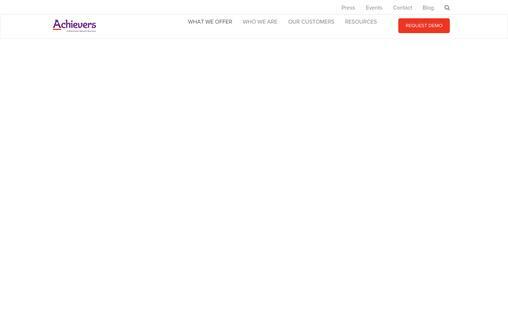 Are you familiar with the best, smart & cheap email marketing software service which has just hit the web? If not, educate yourself with MailGet Bolt – An effective & affordable email marketing solution. 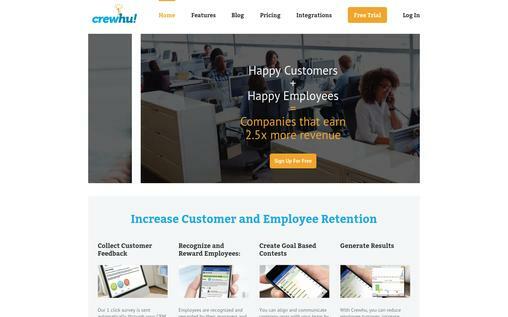 Following is a list of ten best employee recognition software. Selection among these software will definitely help you increase the business scope. This employee and recognition platform allows everyone in an organization to publicly recognize each other through small bonuses that add up to meaningful rewards. Recognition is even more impactful since praise is connected to organizations’ core values. 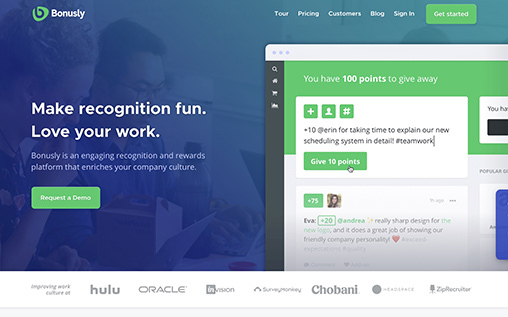 Bonusly has over 175 rewards options to choose from and integrates with a wide variety of applications including Slack, Stride, Zenefits, BambooHR, Zapier, and more. This is a specially designed software that not only keeps record of employees but also gives you a chance to share your feelings with them. Redii Solutions is equipped with the alerts about anniversaries and other important events regarding the employees and gives you a chance to become a part of their life through celebrating their occasions with the team. The software also urges the employees to enhance their work skills. It generates a compatible environment that works wonders for your business. The software helps you unite your team for better performance. The software keeps your employees engaged with their tasks all the time. This is a customizable software that gives you chance to set your tasks and goals according to your choice. The software motivates the employees to do their best for the organization. It also gives you chance to lead the environment as per your own requirements. 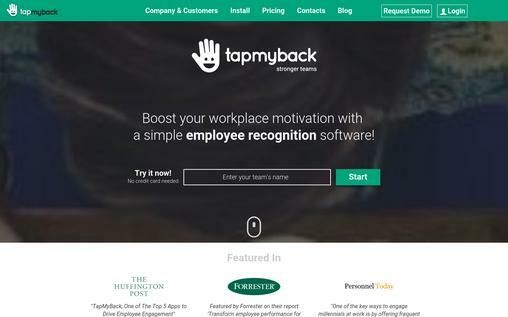 Tap My Back is not only a user-friendly tool but is also a complete log book of all the employees working in an organization. It is equipped with easy manual and can be installed in the mobiles as well. It not only generates a comprehensive report about the functioning employees but also earmarks the deficiencies in their performance. 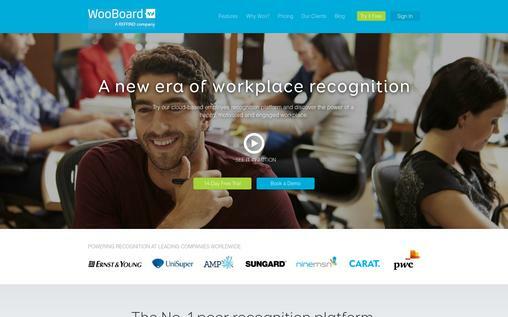 It is recognized as the best employee recognition platform. It is a cloud-based solution to all the problems regarding the employee management. Woo Board generates alerts about the celebrations of your employees and enables you to interact with them as team leader. It gives you a chance to assign them tasks on team and individual levels. The tools used in the software are trustworthy. It not only saves your time but also saves you from hectic file work generated about the employees’ performance. The software is currently being used by leading organizations and is labeled as best for workplace capacity enhancing tool. This software offers all solutions regarding the employee management and recognition. The software not only helps you identify best among your team but also gives other a chance for a better understanding of the nature of their job. 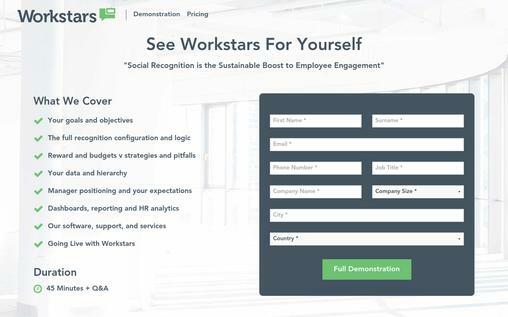 Work Stars is a tool used by many leading firms of the world and has so far produced best results. It analyses great results and enables you to recognize the best employees. It is customizable and you may share the scheme of awarding your employees with them. This will motivate them to work even harder to get the promised prize. It helps in the promotion of recognition culture as well. This software has been designed to give you a chance of real time recognition of the employees. The software is ideal for small, medium and large scale business houses. It is equipped with track management matrix that keeps you alert about the performance of each and every employee. The Kudos Now gives you a chance to interact with your team in real time. It helps in scheduling and maintaining the tasks for the groups and the individuals. It makes your team more responsive and efficient in the work related issues. It also decreases the risk of any work loss. The software helps you automate your program. 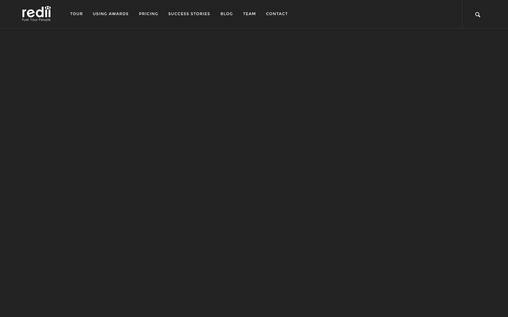 Helps you maintaining the workflow. It is the high rated software for maintenance of workflow at the business place. The software presents a comprehensive report of all the employees and helps you identify best among them. This software motivates the employees to work for better performance. Achievers Software is currently serving renowned business houses and has helped them achieve the maximum. The success stories of various business firms were possible largely due to use the use of this software. Employee recognition is a feature that enables you to generate a comprehensive team for several tasks. It not only boosts the business but also urges you to do more for the worthy employees. It enables you to set goals for employees and measure their skills in real time. The software adds value to your business and provides you maximum opportunities to increase scope of your business. Crew Hu is best known for providing good customer service facilities. It enables you to get connected with the customers in real time and deal with their issues on priority basis. The software has all the required tools that are ideal for customer and employee management. It also helps in creating a good work place environment by urging employees to work at their best. This software enables you to generate a compatible team for your work. The software helps in getting maximum output from limited resources available. The software has ample space to store all the required data for your company. The data is reviewable with various options. Sparcet is working wonders for the leading companies around the world. It has earned recognition of best platform for performance maintenance of any company. The software is equipped with state of the art module that decreases the management cost. It helps the employees to recognize each other in far less time. It creates ideal environment at the work place and gets your job done in more convenient way. 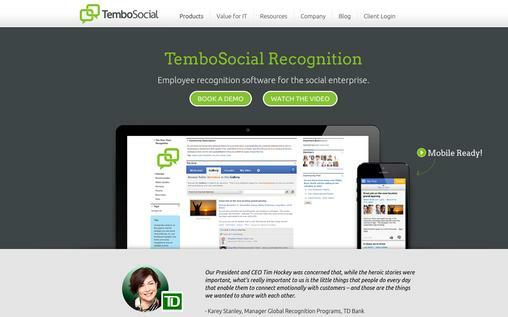 The Tembo Social Software is ideal for generating reports and analysis for the worker performance. The software generates alerts about the employee’s events and gives you chance to celebrate with the entire crew. The software is customizable in order to give incentives to the best employees and keep them engaged in achieving their goals with a better sense of reward at the back of their mind. This software helps increase the efficiency of the workers. The software discussed above are contributing positively towards increasing the business globally. The employees are the basic unit of any organization. Making them feel home is the first and foremost thing. If you manage their performance through an independent source like the usage of a software, it will definitely provide them with a sense of security. It has been witnessed in the past that the organizations have suffered a lot due to the management of labor on the basis of personal likes and dislikes. Software has reduced this threat and have given a better alternative in this regard. All of these are great rewards programs. I would like to add one more to the list. It is called Bucketlist and can be found at http://www.bucketlistrewards.com. The best way to increase employee engagement is to make employees feel valued and appreciated at the office. We all understand that work is work, and that the average person would rather spend his/her time doing their favorite activities. At Bucketlist, we reward employees with experiences to create a happier, healthier, and definitely more enjoyable work place. At Bucketlist, we have discovered that people are motivated by accomplishing life goals, not collecting gift cards. The Bucketlist Employee Engagement Software does a couple of unique things to improve employee engagement. We have a 97% satisfaction rating from employees. Our software is designed to make your company culture stand out and attract the best talent. If you knew work would pay for you to eat pasta in Rome or go scuba diving in Cancun, you’d definitely want to apply for that job. Bucketlist integrates with Slack. This integration means that more employees use the software – and thus more employees are motivated to earn their rewards. While there are many good employee engagement softwares out there, Bucketlist resonates well with many tech companies and companies that employee millennials.